A cavity filling is the primary procedure dentists use to treat cavities, which happen to be one of the most common issues that dentists see. For this reason, we will discuss what a cavity is, the primary causes, and how we treat cavities. First of all, a cavity causes permanent damage to the tooth that develops into tiny holes on the surface of the tooth. If cavities are left untreated, they can cause a toothache, infection or abscess, and even tooth loss. How Do I know if I have a cavity? Can I tell on my own? Typically, the initial stages of a small cavity will not have any symptoms. Whenever possible, it is best to treat the tooth when a cavity is still in its initial stages of decay, because we are able to successfully treat the cavity with a filling. Furthermore, the other benefit of early diagnosis and treatment is a lower risk of post-op sensitivity. Above all, when left untreated, a cavity will continue to cause tooth decay, and often times it will begin to involve the nerve. For that reason, severe decay can begin to affect the nerve, leaving only a root canal or extraction as options to treat the tooth. Oftentimes, a person will not notice that they have a cavity when it is in its early stages, because it is only on the superficial part of the tooth. Therefore, it is important to practice good dental hygiene, have regular cleanings, and get dental exams to diagnose and treat cavities early. What are the different techniques/methods dentists use to determine if I have cavities? What are cavity fillings made of? At Montana Roots Dental, we most commonly use the tooth-colored composite. 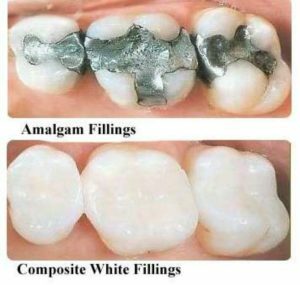 In some cases, we will use amalgam fillings if the patient prefers. Why is a cavity filling important to get? It is important to get a filling, when possible, because it prevents further tooth decay. Tooth decay will continue to progress and develop into a more serious issue until it is treated. When a filling is not used to treat decay, it will eventually go deeper into the tooth and likely cause pain. What happens if I don’t get a cavity filling? Left untreated, a cavity will continue to decay the tooth, and will eventually encroach on the nerve of the tooth. If a cavity reaches this point, a root canal or extraction may be the only options to treat the tooth in order to make the pain go away. Schedule a consultation, cleaning, or exam. If you think you have a cavity, please contact us, and we can schedule an appointment to see if a filling is necessary. You can navigate back to our general services page or call our office at: (406) 442-0282.